"Narnia . . . where giants wreak havoc . . . where evil weaves a spell . . . where enchantment rules. Through dangers untold and caverns deep and dark, a noble band of friends are sent to rescue a prince held captive. But their mission to Underland brings them face-to-face with an evil more beautiful and more deadly than they ever expected." 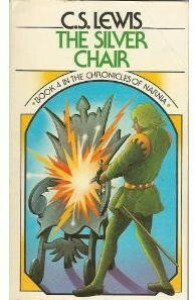 The Silver Chair was read as part of the C.S. Lewis Project that I'm undertaking with a group on Goodreads. I remember so well the first time I read this story to my two children, all snuggled up in bed with book in hand. Each night we read one or two more chapters of the series until we were finished the final act. I'm still not sure who of the three of us was most enthralled as we visited Narnia with all the different children and shared in their adventures. This book has Eustace and Jill being summoned by Aslan to undertake a perilous task. Prince Rilian, son of King Caspian, has been missing for ten years without any word of his whereabouts. Their task is to find the prince and bring him back to Narnia. Their journey has them in lands not previously explored, deep beneath the earth in caves best left forgotten, encountering all kinds of strange creatures, enormous sized owls, Marsh-wiggles, giants, gnomes, and an evil witch who ensnares all with her spells of enchantment. I just loved this series, and this book most of all so far. Christianity is portrayed through various animals, foremost of which is Aslan, a talking lion, who breathes life into the world around him, but it is subtle (the first reading I never once made the connection) giving us a wonderful adventure fantasy that the entire family can enjoy. If you haven't read it before I recommend you do.